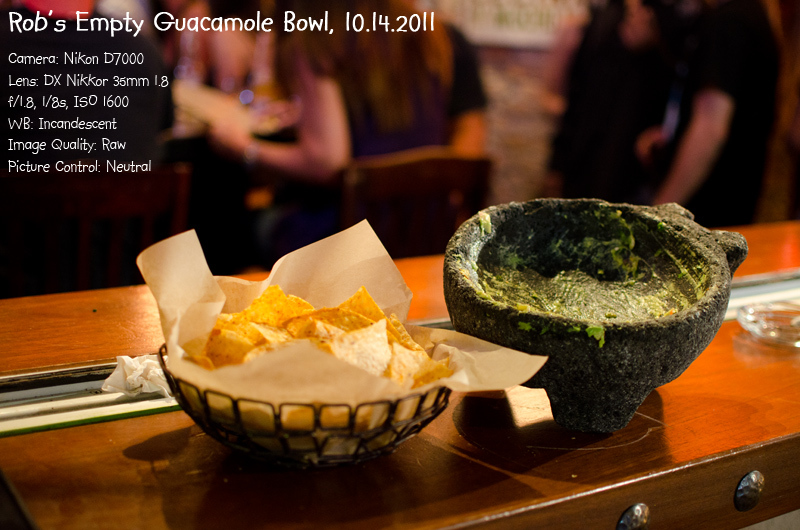 Tonight I went to Rocco's Tacos in Fort Lauderdale for some of their guacamole. They make it fresh, in front of you, when you order it! You watch them cut open fresh avocados and mash them up in a cool looking, stone bowl. Next, they add fresh cilantro, diced tomato and onion, fresh lime juice, and some spices. As many of you know, I try to make raw food a substantial part of my diet and guacamole is one of my favorite raw foods. When I order it, I always ask for extra jalapenos. The chips are certainly not raw, so I try not to eat too many of them. The staff probably thinks I'm crazy because they always return to find my guacamole bowl empty and my basket of chips still full. After I finished eating, I was talking to my friend Thea in New York. Thea is a dedicated raw foodist who is also studying photography at Columbia. I told her the guacamole story and she prompted me for a photo. It was pretty dark but I didn't use a flash or a tripod. Thea likes taking pictures at night so I added the captions so she could see how I set my camera. I have no idea why I used that font.